"I was wrong and we are gonna kill this track"
Last night, Eminem surprised us all with the delivery of his new album Kamikaze. 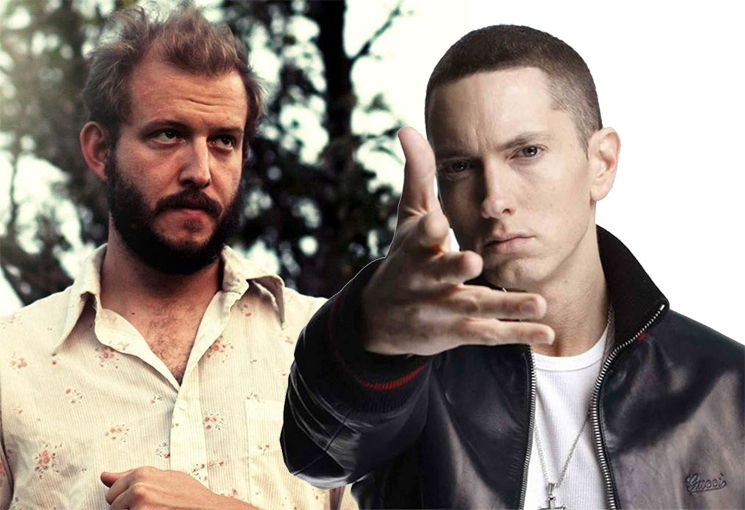 While Em's fans have likely spent the last 12 hours telling everyone they know just how good of a rapper he is, one person attached to the album is none too pleased — Bon Iver's Justin Vernon. Vernon is credited as having vocals on the track "Fall," which, like most Eminem songs, features the homophobic f-slur. When reached about the track on Twitter, Vernon said he wasn't in the studio for it. "Not a fan of the message, it's tired," he added. "Asked them to change the track, wouldn't do it." In a series of follow-up tweets, Vernon later posted the following: "This is not the time to criticize youth, it's the time to listen. To act. It is certainly not the time for slurs.... I was wrong and we are gonna kill this track." However, as of press time, it's unclear what "kill this track" actually entails. Big Red Machine, his collaborative project with the National's Aaron Dessner, also released their self-titled debut today. The original version of this story was last updated at 2 p.m. EDT.